Heaven, but a Mother in Heaven as well. This doctrine came from what they call “latter day revelation”, yet it isn’t something you’ll find in any of their extra scriptures. 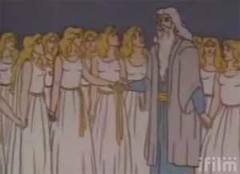 Mormonism teaches Heavenly Mother is the wife of the Mormon god, and was most likely his wife in the life she lived before earning her place by his side as his goddess wife of the planet earth. “The fact that there is no reference to a mother in heaven either in the Bible, Book of Mormon or Doctrine and Covenants, is not sufficient proof that no such thing as a mother did exist there…. does not common sense tell us that we must have had a mother there also?” (Answers to Gospel Questions, vol. 3, p.142). The main reason Mormons believe there has to be a Heavenly Mother is because the god of Mormonism can’t create something out of nothing. They reject the Creation account found in the book of Genesis and instead lean towards Joseph Smith’s own account of how the universe was “organized”. This leaves the Mormons with only speculation, and with no other choice but to rely on the words of Smith vs. the words of God. Joseph Smith revealed to the Mormons in early 1839 “the concept of an eternal mother.” (Mother in Heaven, Encyclopedia (4vols.) page 961) From this teaching, Eliza R. Snow, who was one of Joseph’s plural wives composed a poem that was later set to music and become O My Father a popular hymn sung in the Mormon Church. “In the heav´ns are parents single? Tells me I´ve a mother there. Mormonism has consistently taught that every human being who has ever lived is the literal spiritual offspring of heavenly parents. Their doctrine teaches that all of us lived as the spirit children of our heavenly parents in what is called the “pre-existence”. Mormon doctrine teaches the spirit children of their god and heavenly mother included Jesus and Satan, whom the Mormons routinely refer to as Lucifer. “God has made His children like Himself to stand erect, and has endowed them with intelligence and power and dominion over all His works, and given them the same attributes which He himself possesses. He created man, as we create our children; for there is no other process of creation in heaven, on the earth, in the earth, or under the earth, or in all the eternities, that is, that were, or that ever will be.” (Journal of Discourses 11:122-123). Mormons would become highly irritated and insulted if you were to suggest to them their religion teaches that a sexual union between “heavenly mother and father” was needed to create all the spirit children, including Jesus Christ. Yet it goes without saying this is the only plausible explanation when you believe in a god who is an exalted human man with a body of flesh and bone and in his goddess wife who is also an exalted human female with a body of flesh and bone. The whole notion of a pre-existence, spirit children, mother goddess and a father god from another planet sounds more like a really bad Star Trek episode instead of something from a religion claiming to be Christian. The closet Biblical reference to a “Queen in Heaven” is found in the book of Jeremiah. As I write this article I think back to the time I was sitting on a stool in the Washington DC temple. I had just been “washed” and was being anointed to be a “queen and priestess” to my husband in the eternities. I remember thinking how odd this doctrine felt, and uncomfortable it made me to think I could hold in such a high and exalted position. The more I study other religions the more I see how Mormonism is nothing more than a patchwork of bits and pieces of other religions stitched together. Like Mormonism the followers of Wicca and Hinduism believe in goddesses and fashion for themselves a god and goddess to suit their needs. Joseph Smith created a god for his new religion that fit into what he believed a god should be. Of course his god had to have a female companion to complete him, who would assist him in creation because he is incomplete and unable to create something on his own. “Implicit in the Christian verity that all men are the spirit children of an Eternal Father is the usually unspoken truth that they are also the offspring of an Eternal Mother. An exalted and glorified Man of Holiness (Moses 6:57) could not be a Father unless a Woman of like glory, perfection, and holiness was associated with him as a Mother. The begetting of children makes a man a father and a woman a mother whether we are dealing with man in his mortal or immortal state. This doctrine that there is a Mother in Heaven was affirmed in plainness by the First Presidency of the Church (Joseph F. Smith, John R. Winder, and Anthon H. Lund … they said that “man, as a spirit, was begotten and born of heavenly parents …” (Mormon Doctrine, 1966, p.516). Unlike the God of the Bible, the Mormon god was unable to create those individuals who would become his children all on his own. It gives me great joy and comfort to worship and know the one, true God. To know that I wasn’t just born one of his children, but he lead me to him, and chose me to be his daughter gives me great encouragement. Mormons may think it’s their birth right to receive exaltation and eternal life because they were born spiritual from “heavenly parents”. I know I will have eternal life, not because of anything I did, but because of a God who is what he says he is. Thank you for the article, I actually learned a lot from it. Super good content on this website. Always looking forward to new post.